While everyone mostly talks about market share in the mobile space and how Android has significantly passed Apple in phones, they miss the much more important driver. Profits !!! Businesses and products die or get killed without profits. Sadly for you, I have to tell ya' - RIM is dying fast. The only news about RIM in the last year, was bad news. RIM is now on death watch. Oh yeah, and Apple OWNS tablets. And the market share pundits further miss the point by often not including all iOS devices in the share numbers (iPhone, iPad and iPod Touch). "So if the industry is booming but the majority of participants in the industry are loss making (and surprisingly so) then what is going on? There are two answers: new market disruption and low end disruption." "When it comes to people actually using their devices, there's no doubt at all that Apple [AAPL] is winning the smartphone wars -- just look at the evidence, for app sales, Web browsing, OS upgrades and more, the iPhone is King of the Hill." "American gamers spend five times more on iOS games compared to those on Android..."
"Despite its dominance in market share, Android is still the second option for big companies developing applications, says Ryan Matzner. Matzner is the director of Fueled, an app design and development company. One thing he almost never hears from his clients is that they'd like to start out with an Android app." From TechCrunch, Yep. Developers Are Still Building For Apple’s iOS Over Android By A Factor Of 2-to-1. "The main reasons for iOS’ continued edge are that monetization is just that much easier plus there are fewer fragmentation issues." Everyone now acknowledges that RIM is the walking dead, and Nokia and many others are nearly dead or only able to scrape out a miserable existence. The only exceptions will be Apple and Samsung. Windows Phone continues to be an industry joke. And poor Nokia has tied their future to it. 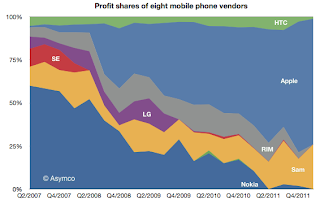 Profits mean far more than market share. And Apple's profits and iOS application profits are crushing absolutely everyone right now, including Android. While Apple's iOS leads Android by far, this will change as Android improves. So mobile app developers should build for iOS, then Android when they can afford it. Side point: And in mobile in the enterprise. Apple iOS owns it. Android is MIA. And Windows.... continues to be an industry joke (if Surface actually works in 2013, MS might have a chance to make a small dent).